Innovative telling of the story of the Turner Prize, told through profiles of each of the winners thus far, most of whom are interviewed for the piece. Who’s Shocking Now? by Charlotte Higgins appeared in Guardian Weekend magazine, 8 September 2007, pp.18 - 35. Many of the artists themselves are, within the feature decidely critical of the Turner Prize, even though winning the prize was invariably a major boost to an artist’s career and profile. 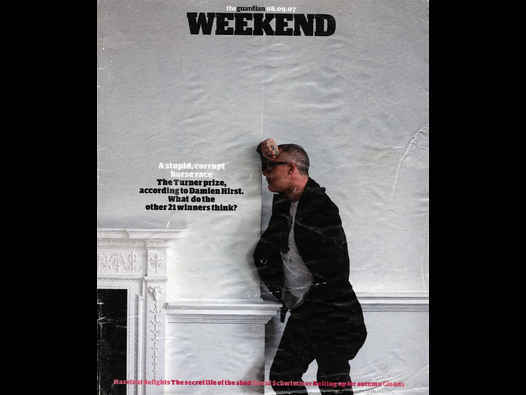 The cover of the magazine featured a portrait of Damien Hirst, with the words, “A stupid, corrupt horse race” ‘The Turner Prize, according to Damien Hirst. What do the other 21 winners think?’ Overleaf, on the contents page, the piece was trailed as Shock therapy When it began in 1984, the Turner prize sparked controversy. Today, it is the world’s best known art award. But what does it mean for the artists? We ask all the past winners how it changed their lives. Portraits of the winners appear alongside the respective sections on each winner. The article began with, “’Like being a Holocaust survivor’, ‘All a bit crap’, ‘A homecoming’, ‘Nice for the parents’ - as a retrospective exhibition gathers up the work of the 22 winners of the Turner prize, Charlotte Higgins asked them all what it was really like to win the world’s best known art award.” The Turner Prize: A Retrospective ran from 2 October - 6 January 2008 at Tate Britain. Nothing is made of the politics of race within the visual arts within Who’s Shocking Now? For instance, that when Indian-born sculptor Anish Kapoor won the Turner Prize in 1991, he was the first non British born artist to do so. Or that when Chris Ofili was shortlisted for the Turner Prize exhibition of 1998, held at Tate Britain, from late October 1998 to early January the following year, he became the first British-born Black artist to be so honoured. The other shortlisted artists – Sam Taylor–Wood, Cathy de Monchaux, and Tacita Dean – were also of the yBa generation that had come, and indeed would continue, to dominate Tuner Prize shortlists. The award was, in due course, made to Ofili, who had, according to the official Tate publicity of the time, been shortlisted “for the inventiveness, exuberance, humour and technical richness of his painting, with its breadth of cultural reference, as revealed in his solo exhibition at Southampton City Art Gallery and in Sensation at the Royal Academy, London.” (1) Ofili went on to win the Turner Prize and in this endeavour his painting, No Woman No Cry, (which was the star of his display) helped him. A reproduction of the piece, rather than a portrait of Ofili himself, accompanied his section of Who’s Shocking Now.